From 4 to 6 september 2008, the Escuela Gestalt de Diseño and the MUTYE – Museo del Transporte y Exposiciones in Xalapa (Veracruz, Messico), host the sixth edition of LPM – Live Performers Meeting: international encounter of livevideo performers, visual artists and vjs, dedicated to live video performance. LPM brings to xalapa the latest trends of AUDIOVISUAL DESIGN, trouhgt the partecipation of the most important representative of european and international veejaying culture, archetype and promoter of a movement that includes: art, design, technology, experimentation, innovation, evolution. A tribe of professionist and passionate ready to meet in Xalapa all that visitors: designers, passionates of arts, video and new technology, curious people or careful observers of the new artistic trends, explorers of the new frontiers of the design and the audiovisual that can’t miss the chance to spend three full immersion days with exchange activities, research, conception and planning in the field of live visual. Visitors can learn and delve into all the theoric-practical aspects connected to this innovative field of the audiovisual design, taking part to open encounters, workshops and showcases of cutting edge projects and products. Not-to-be-missed the scenery of audiovideo live performances created by the many artists arriving from all over the world to offer to the mexican audience a sample of their own work coming one after the other. The fifth edition, recently organized in Roma in may/june 2008, registered the presence of 257 artists coming from: Algeria, Argentina, Austria, France, Germany, Japan, Guatemala, UK, Italy, Lithuania, Poland, Portugal, Spain, Sveden, Switzerland, Turkey, Hungary. During four whole days, 142 show and performances brought to new life the over 900 square meters of Macello IV – Mattatoio di Testaccio, set up with 13 projectors and mega-screens. The night is charachterized by many audio video performances which follow one each other and ends with the Dj sets and the Vj Clash, with the visuals of the vjs that will interchange their performance on the available video consolles. With this special mexican edition, LPM moves over the ocean for its first time to meet that broad part of south-american community, who has always followed the Meeting and the FLxER community since its first inititatives. On 4th and 5th september, the Escuela Gestalt de Diseño of Xalapa hosts a full schedule of workshops/showcases of projects, softwares and cutting edge products, audio visual performances, multimedia live shows and vjsets open to the audience. The workshops and the showcases will take place in the Classroom of the Escuela (“OFF” Area). The performances come one after the other in the Auditorium (“ON” Area), on the Stage 1 set up with 3 mega-screens, and keep on in the suggestive open-air space in the Terrace, set up too with an independent video system and three mega-screens. The MUTYE – Museo del Transporte y Exposiciones di Xalapa will host on 6th september the closing night of the event. At the end of the performances will start the DJ sets that will create the sonic texture for the Vj clash, non competitive challenge among the visuals of the many vjs attending to the Meeting. LPM represents a place of “real” encounter, a “physical”space, a direct chance of dialogue and comparison for artists and passionate of arts and digital technologies who usually meet, communicate and interact in the “virtual” space of the net. The experimentation is one of the founding element of LPM ideology, for this reason allthe founds saved from the Meeting are invested in the most innovative technologies to support the Event and to enhance the research activity in the live visual field. Last year LPM took part in the AVITNetwork, sharing the same ideologies and roots. The activity of AVIT is focused on the enhancement and promotion of veejaying culture, trought the organization of worldwide events. After the first english festivals, AVIT promoted the creation of an international network, establishing collaborations in Germany (AVIT Berlin), in France (AVIT France) and also in Italy with LPM. This partnership between “network” and “meeting” has been possible thanks to the common cultural background and to astrong affinity in intents and spirit. LPM is not a festival, but it is a chance to get in touch with artists from all over the world and to showcase your own project or, even better, a work in progress. Our aim is to give the right space to all the performances, that’s why each intervention should take not more then 30 minutes. For the performers/exhibitors who want to present their work, project or performance during the Meeting the subscription is FREE and it’s open until 31th July 2008 15th August 2008. Besides is foreseen the possibility of free accomodation for the performing artists. For the visitors who want to access to all the acitivities of the Meeting: workshops and showcases (4th and 5th sept.) and/or partecipate to the final Party (6th Sept.) the subscription foresees a fee. For the performers/exhibitors and for the visitors is possible to subscribe since today following the instructions that you can find in the participate section of the website. 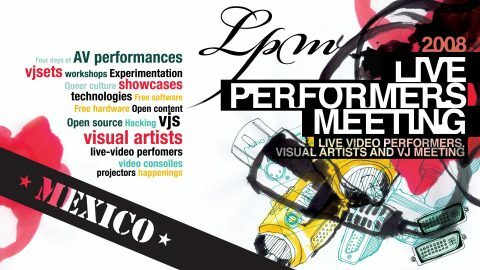 LPM is produced and organized by Flyer Communication (flyer.it), Fabrik project, FLxER.net (flxer.net) and FLV – Flyer Live Visuals, with thanks to the collaboration of important international partners.